Ioanna Baez et Bob Dylan. 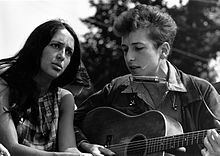 Robertus Allen Zimmermann, maxime notus pseudonymo Bob Dylan (natus die 24 Maii 1941 in Duluth Minnesotae), est musicus rock, citharista, et cantor Americanus. Multos annos Ioannae Baez sponsus fuit. Anno 2016 Praemium Nobelianum litterarum accepit ratione "creationis expressionis poetica in musica Americana". Novissima mutatio die 13 Octobris 2016 hora 12:05 facta.